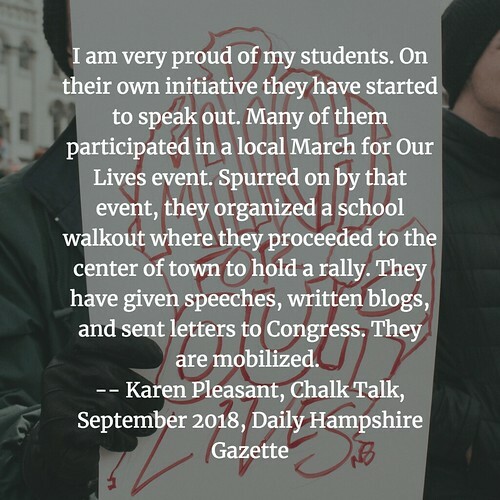 Our Western Massachusetts Writing Project has long nurtured a partnership with our local newspaper — The Daily Hampshire Gazette — as a way to help teachers in our WMWP network get published in a monthly column called Chalk Talk. I coordinate the program, acting as recruiter of teacher-writers (one of our missions in the writing project), editor and sounding board, and liaison to the newspaper. 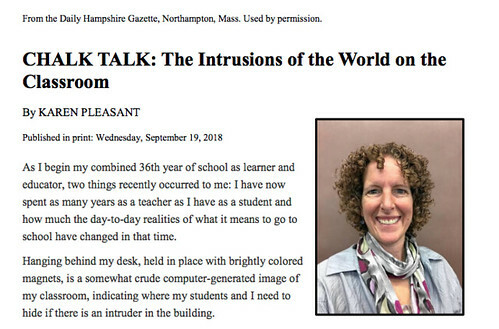 Our first writer for this new school year, Karen, writes about the intrusions of the world on the classroom — of the fear of gun violence, and strangers in the building, and the impact all of those considerations have on educators and students alike. It’s a sober look at the world today, through the eyes and heart of a veteran teacher. You can read Karen’s piece here and you can read the many Chalk Talk pieces we have published over the years.